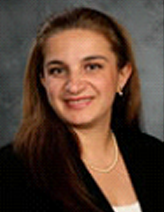 Roxana Mehran, MD, FACC, FACP, FCCP, FESC, FAHA, FSCAI is Professor of Medicine and Director of Interventional Cardiovascular Research and Clinical Trials at the Zena and Michael A. Weiner Cardiovascular Institute at Mount Sinai School of Medicine. Dr. Mehran completed her training in internal medicine at the University of Connecticut, where she was also a Chief Medical Resident, before continuing with Fellowships in Cardiovascular Disease and Interventional Cardiology at Mount Sinai Medical Center. Dr. Mehran is internationally recognized for her work as a clinical trial specialist with complex data analyses and outcomes research within the field of interventional cardiology and for her experience and expertise in working with regulatory agencies to conduct clinical trials. Her research interests expand from mechanisms of restenosis to treatment and prevention of acute kidney injury in cardiac patients, as well as advancing treatments for acute coronary syndromes and acute myocardial infarction. In addition to founding a highly regarded academic research organization (ARO) within the Cardiovascular Research Foundation, she is also a widely published author and frequent invited speaker at national and international scientific conferences such as American Heart Association, American College of Cardiology, European Society of Cardiology, and EuroPCR. She has served as Course Co-Director of the annual Transcatheter Cardiovascular Therapeutics (TCT) for the last 13 years. Dr. Mehran serves on editorial board of multiple peer reviewed journals, including Journal of the American College of Cardiology, Circulation, and Circulation Research. She currently serves on the board of trustees of SCAI, as a member of the Program Committee for the American Heart Association Scientific Sessions, as a member of the board of directors for Harboring Hearts, and as Program Chair for Society of Cardiac Angiography and Interventions (SCAI- WIN (Women in Innovations)) Initiative, and is also the Chief Scientific Officer of the Clinical Trials Center at the Cardiovascular Research Foundation (NYC).